The following motion was submitted to the IUCN WCC Jeju 2012 Motions Committee. It has 34 co-sponsors, reportedly the most in WCC history. As required, more than three of the following five criteria have been met and are explained as follows. Please note that what is listed is only a small part of what could be listed. 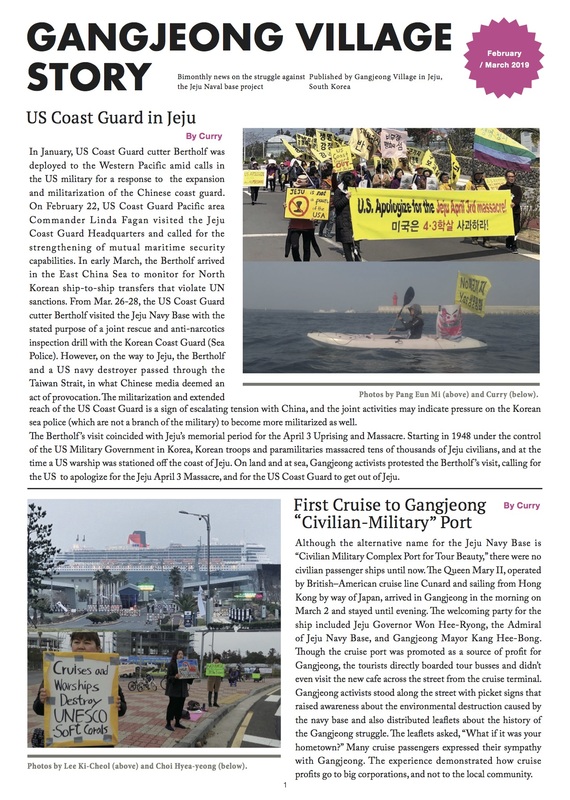 Gangjeong Village, the party most directly affected by the naval construction, did not have access to information regarding the nature of IUCN or the process to bring their concerns to IUCN. They first learned about it from IUCN members responding to their July 11, 2012 Open Letter. They were never approached by the host country about membership, workshops, motions, etc., as was done with other NGOs, universities and government bodies. IUCN members outside of the country were assured by the Union that everything was appropriately being carried forward, and new information emerged over the course of the last 90 days that this was not true. The EIA was only completed after villagers filed suit, and did not involve input from the local community. It was released to the Gangjeong Villagers on July 18th, and the subsequent translations and/or disbursement to scientists and academics was around July 26th. Knowing the IUCN Congress was quickly approaching, well respected and dedicated scientists immediately flew to the country to make a proper assessment of the species at risk. The revised assessment from a team of scientists with Endangered Species International was received September 3, 2012, ENDANGERED SPECIES RELOCATION ASSESSMENT, CIVILIAN-MILITARY COMPLEX PORT DEVELOPMENT, JEJU ISLAND, SOUTH KOREA. (entire report available). Findings from the habitat and species relocation assessments show failed relocation for the endangered K. borealis where all breeding frogs were left on site and only tadpoles were removed. The released tadpoles are thought to have a low survival rate due to the presence of potential predators. The relocation of the C. denticulata keunbaei was incomplete, as a population still remained on site. Further, 5,300 shrimps were released downstream along Gangjeong Creek where a population of C. denticulata keunbaeis had already been established. This increased the risk of surpassing the carrying capacity of this area. Shrimps should have been released at other alternative suitable sites to increase the chance of their survival. The irrevocable nature of the damage has become apparent as the caissons were built in the last 90 days and cannot be removed without explosives. The government currently gives the impression that this project has the consent of the citizens of Gangjeong. On April 26, 2007, the previous mayor held a small referendum where 87 villagers were present, and for the first time, counted a vote through clapping. However, only upon recent fact-finding was it discovered that there was a referendum on August 20, 2007: 725 villagers voted, 680 voted against, 36 voted for, and 9 votes were defective; therefore 94% of voters were in opposition of the project. This second referendum is not recognized by the government. Dr. Imok Cha, a highly respected oncologist and registered participant of IUCN, was deported on September 4th for the first time in her life. She was invited as a panelist to the official CEL workshop on ethics. She was helping the villagers to understand the EIA and the scientific gaps of the document. No reason was given for her deportation. Umisedo Yutaka and Matsushima Yusuke, members of Save the Dugong, a new IUCN member as of WCC4 Barcelona, were deported on September 6th. They are listed partners of Save Jeju Now. In the past three months, numerous requests were made to the DG, President and other IUCN Secretariat leadership to create a space for the discussion of the naval base, and all requests were denied. When members modified their own workshops to give the issue a voice, and made it known during the weeks before the WCC, they were targeted and questioned by IUCN Secretariat. The Korean Navy gave its first press conference on the naval base on September 6th, stating it as ‘eco-friendly.’ The level of green-washing taking place is something new, urgent and unforeseen. We are concerned that private and public sectors from around the world are misusing the term ‘green’, ‘green economy’, and ‘green growth’, similar to the misuse of the term ‘sustainable development’ historically (Res. 1.46 Use of the Concept of Sustainable Development, “CONCERNED THAT in practice environmental factors are not yet fully incorporated into all projects and programmes which are termed “sustainable development”). Due to their protests, many villagers are in prison and awaiting trial. Construction and dredging is taking place, and the pace is increasing, day and night. Deportations are increasing, and includes nationals and internationals. Unless action is taken immediately, the loss of biodiversity, the loss of this ecosystem, and the loss of this community, will be irrevocable. The caissons are being set in place, and once they are placed, there is no way they can be removed except through explosives. Water supply of this southern region of Jeju comes from an aquifer in the village that is being irrevocably destroyed. The tangerine farms in Gangjeong and the soft corals are already seeing damage due to the settling dust from the construction. Entire fields of tangerines are rotting. This is directly impacting their economy today. Registered Korean participants are being searched for Gangjeong Village materials when they enter the WCC which are then immediately taken away. In the DG’s letter, she stated that they would be able to hand materials out. Registered participants and invited speakers from the village are afraid to enter the WCC, that they will be harassed by the alarmingly high levels of police, military and security. One registered participant had her sticker ripped from her IUCN badge after entering the conference center. The construction has already fenced off coastline that is integral to the welfare and survival of the villagers: this winter, for the first time in 4,000 years, the villagers will not be able to gather the many seaweeds that grow on the Gureombi, a main source of sustenance. It would seem reasonable that IUCN would anticipate issues of this fundamental seriousness within the host country, and in such close vicinity to the Congress site, and prepare a vehicle by which it could be discussed and objectively assessed by the membership. It was unforeseen that IUCN did not inform the membership or provide a space for dialogue at the Congress. Typhoon Bolaven hit the island around August 27, 2012, damaging all seven caissons and other structures, giving evidence to the scientific geographical inappropriateness of the base. Typhoons hit Jeju many times each year and are increasing in intensity due to climate change. Samsung, the sponsor of WCC, was not promoted on the official IUCN WCC site until the WCC opened. Samsung funds the naval installation. This is the same concern for Hyundai. So, not only is IUCN not informing its participants of the issue, but they are taking financial support from one of the developers of the base. IUCN has a duty to investigate its partnerships. The formal application of a booth was denied to the villagers, due to ‘on-site partners’ (August 28, 2012 IUCN Statement Responding to the Third Open Letter) on August 22. It was completely unknown to membership that a host country or ‘on-site partners’ could have any censorship role in the policy and programme of IUCN. The need for a motion was discussed at the IUCN CEL Commission Meeting, Days 1 and 2; the Knowledge Cafe on September 7th, A Case Study in Integrating Ethics into the Management of Water Ecosystems, “The Loss of Wild Rivers and Coastal Communities in Korea: reconciling IUCN partnerships and their vision of a just world that values and conserves nature” hosted by the Ethics Specialist Group, IUCN Commission on Environmental Law; Save Jeju Now; Gangjeong Village Association; the Water-Culture Institute; the Water Ethics Network; and the Center for Humans and Nature; and is the focus of the CEL Workshop on September 10th. The Knowledge Café was the largest in the known history of any of the involved members, drawing numerous media and over 30 participants, all surrounding a single table. Our membership yearned for this information. They care about the issue and want a stop to the construction of the base, a stop to the destruction of the people and nature. This motion needs to be voted upon, for the future of this village, for the future of this island, for the future of the people and species that live here, and for the future of IUCN as a leader in the international environmental forum. This is an issue of democracy, transparency, conservation, science, law and ethics. This is an issue of a small village, a unique and disappearing culture, surrounded by complex and fragile biodiversity, and all immediately and irrevocably threatened.